Discussion in 'Model X' started by Camera-Cruiser, Feb 13, 2016. Hi all, I posted yesterday about seeing the X at the Buena Park Sales & Service Center while dropping my Model S off for service. I went back today and they had an extra treat for Model X testers.The manager brought her brilliant orange Tesla Roadster in for everyone to see and it is stunning. I took a few more picts of the Model X too. Lots of room in the frunk, and I like the grill-less front nose more and more. I sat in the middle seats to see how big the front window is, and it's enormous. All rear passengers will feel very connected to the front, it's the exact opposite of the tunnel vision you sometimes get in other SUVs. Plus I took a few more shots of the red one with the cool LED accent lights. All in all, a good time to need some 100% under warranty service! They loaned me a P85+ rocket ship while mine was there too. Which makes me really want that or a P90D in either an X or another S.
Tesla service is unlike anything I have ever experienced in 35 years of car ownership! Nice set of pictures! Thanks for sharing them. Is that the multi-coat red in the last few? This is the closest store to me. I called them earlier in the week to see when they'd have the Model X available for test drives for the general public and was told "May". I'm sure I'll come up with some excuse to go there before then. My question: Why can't you get the S and X in that orange!? As an owner of a "Very Orange" Roadster I will say that it is an awesome color for a small car, but I think it would be overpowering color for a large car like an S or X, and would have few takers. So is the Model X stationed the Buena Park center for anyone to see? 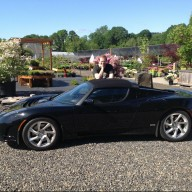 I would rather fight the traffic in the slow lane than put HOV stickers on that beautiful Roadster. On the Roadster, Very Orange is just stunning. To see, yes. I was there for service and I was allowed to sit in it, take pictures, press buttons etc. my Model S sales advisor told me I could drive it if I wanted and that if I knew people who wanted to do the same, they should call the service center and ask if there are any open slots to drive it. This is really an event for reservation holders to check it out and make final decisions about ordering and configuration. Everyone had concert/event style badges to drive. I stayed out of their way and did not want to take a drive slot. They had a "spare" X in service that I mostly checked out. The event ends today (Sunday Feb 14th). I'd say if you live near the Buena Park service center, and just want to see it, just go for it. Call if you want to drive. Bummer, just missed it. So after Feb 14, they won't have the X? They told me that Costa Mesa was next and San Diego after that. Contact those locations or maybe someone will post info when it is occurring. Don't delay, this is not posted on the Tesla web site. There was a check-in table for badges, but I didn't need one to view and sit in Model X.